Martin Shkreli is a man I admire in an odd sort of way. The recent controversy involving Mr. Shkreli and his price hike of the toxoplasmosis drug, Daraprim, seems to have caused misguided furor towards the 32-year-old CEO of Turing Pharmaceuticals. He may epitomize a major problem with the pharmaceutical industry but he is simply playing by the rules his pharmaceutical executive contemporaries and predecessors have helped set in place. Much like Donald Trump and his history of bankruptcies, he’d be foolish not to take advantage of every oversight weakness or loophole set up by a corrupt system that affords advantages to those who are shrewd enough and willing to exploit them. The public’s anger is directed at the man and not the system. If Shkreli were to step down or be forced to resign, do people think that the next CEO of Turing Pharmaceuticals won’t be as zealous or brash in exploiting the system? People dislike him for the price hike, but loathe him for the way he defiantly acted in response. If I were a board member I would demand that my CEO rigorously investigate every pathway to make the company more profitable and therefore more financially stable, but I would also want them to exhibit a measure of temperance so as not to attract unwanted public spotlight. It seems as though people would be willing to forgive and forget a less brazen pharmaceutical executive. Every public dollar not claimed by Turing Pharmaceuticals is a dollar that will be spent elsewhere, or heaven forbid end up in the coffers of the competition. 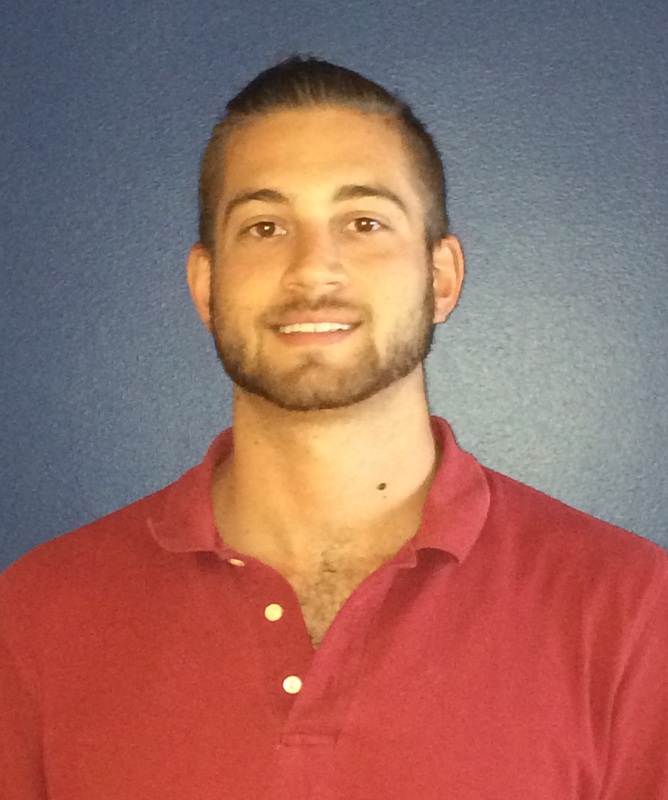 As for the relationship to medical students, pharm and biotech industry sales reps are not seen or heard from during the first two years of our schooling. We are in the classroom and there is no official school-sanctioned time allotted to these groups unless specifically invited by a student organization. There are no events or talks sponsored by companies, and all faculty must divulge any real or perceived conflicts of interest when lecturing. This changes in the clinical years (third and fourth year) when the students are out and about amongst the physicians, nurses, and patients in the hospitals and clinics. Students are left to their own devices and are sometimes in rooms with Big Pharma reps during presentations for a new product or during demonstrations of a new surgical device. The “good” reps will gravitate towards the students after they’ve made their pitch to the higher-ups and start chumming it up with those at the bottom of the totem pole and those with the least decision-making capacity. My first encounter with a sales rep was right before entering the operating room (OR). Gowned in scrubs, all entrants into the OR look nearly identical and no hierarchy can be discerned readily, like it can be up on the patient floors. There doctors wear long white coats, nurses wear scrubs, and students wear short white coats paired with a look that can only be described as confident confusion. There the pecking order is clear. The OR is murkier—we’re all wearing blue scrubs so the nurses and students are dressed like the doctors are dressed like the students. The man approached me and asked if I was a student and we began chatting. I assumed this guy was of some import—he was tall, he spoke confidently, and he knew everyone’s name entering the OR. As the conversation shifted from what my first few days at the hospital were like, he started extolling the sophistication and ease of use of this new surgical device that would be employed for this particular operation. Then it hit me that this guy was just a salesman. He knew who I was, right? Him selling me on his product would do absolutely nothing for his company’s bottom line and his quarterly sales wouldn’t see the slightest uptick whether or not he had ever spoken to me. He gave me his card and told me to be on the lookout for his company’s reps in all my future endeavors. Man, I thought, he was such a nice guy. As the weeks went on I encountered other reps while in the hospital. All of who were just as nice. What an endearing industry. Drexel had done a superb job at shielding its first and second year students from the influences of third party companies. We had almost no exposure to the sales pitches coming out of the mouths of these charismatic salespeople. We were being released to the world as naïve students. Were these reps being nice for the sake of being nice? Of course that’s a possibility. What’s much more probable, however, is that they are all planting the seeds of merchandising as soon as they are able. I wouldn’t be advising any hospitals to buy any new surgical devices, nor would I be prescribing any meds for a few years, but when the time comes, I will already have that brand recognition stored somewhere in my brain. As students we are never given formal training in how pharmaceutical companies operate and what we can expect to deal with for the rest of our careers, regardless of our specialty. We have a Business of Healthcare course that does a great job of outlining the history of US healthcare, how it came to be the way it is, and how insurance companies fit into the puzzle that is the US healthcare system. I once believed that it was a good thing that med school limited exposure to Big Pharma, and that this limited access to its students would offset some of the pernicious effects of physicians becoming beholden to a drug company. As our system is set up now, students or recent med school grads will be inundated with free luncheons, demonstrations, and gifts that are designed to both inform and persuade physicians and future physicians to prescribe certain medications. There seems to be real value in these demonstrations, as it is a way for those in healthcare to stay current with advances in research and technology. The FDA and Big Pharma continue to battle about how much free speech the for-profit pharmaceutical companies can claim when marketing their drugs and devices. Students are not given much information regarding the politics of what is going on in Washington, D.C. It is important to learn about how our healthcare system works and to truly be advocates for our patients, doctors need to be versed in the discussions going on in the capital. Perhaps to steer clear of politics and controversy, medical schools opt to leave this discussion out altogether. Or perhaps not; in order for physicians to best advocate for our patients and their health, we need to know the rules of the game. Med schools need to find the balance between creating competent, knowledgeable physicians who understand their field very well but that are also aware of all of the players in the game and what’s at stake. I’ve found that many of my colleagues find the political aspect of medicine tedious, boring, and too time consuming to delve into the intricacies of policy creation. It is this lack of knowledge or fundamental misunderstanding of the relationship between physicians, pharmaceuticals, and the government that makes doctors more susceptible to persuasion by the sales reps as conflicts of interest in the health practitioner field aren’t readily apparent. The relationship between pharmaceutical and biotech companies with medical schools shouldn’t be adversarial, but when the goals of the healthcare provider and healthcare-related companies don’t coincide, the physician and the patients need to be made aware. Talks by prominent physicians that are on the payroll of drug companies need to be scrutinized. Papers applauding new breakthrough treatments need to be rigorously investigated because even peer-reviewed journals are not free from bias. There is no ideal time during the course of our education that this information would naturally fit, but it is vital and it should be taught early on so that when we are released into the hospitals we will have practice with critiquing sources and being mindful of current legislature concerning what parties are spending money and where they are spending it. If you set up a system that can be exploited you will attract those that are the best at this exploitation. It is easy to set the ire and pent up aggravation at a wasteful system onto the figurehead with the likeness of a James Bond super-villian, but the release of the collective frustration still does not change the underlying current of how our healthcare system is run. If we’re not educating future doctors on how to effectively combat an (at best) unfair or (at worst) corrupt system, then who can we rely on to give patients a better handle on their own health? As far as Mr. Shkreli is concerned, he’s just a example of what can happen when an arrogant, young, former hedge-fund manager gets his hands on a product that people need. He’s willing to be the face of a controversy and actually exemplify to the public how screwy the system is. Like Donald Trump proclaiming to donate heavily to both parties in order to personally benefit, Shkreli is opening our eyes to the nature of business side healthcare. Rather than being angry at why someone would do this, be angry at how someone could do this. Don’t hate the player, hate the game. The National Education Association (the union to which I used to belong) is considering an early endorsement of Hillary Clinton. This decision, like the American Federation of Teachers’ endorsement of Clinton on July 11, would be a huge mistake. One reason is that it would violate members’ trust. As Peter Greene, Steven Singer, and Anthony Cody have noted, teacher voice is too often ignored in education reform conversations. If the NEA follows the AFT and makes a presidential primary endorsement without ample membership involvement, its teachers will feel silenced by their own union. Not only would that likely depress voter mobilization efforts and spark a backlash within the union, it also runs counter to the very principles of what a union is supposed to be. An early Clinton endorsement would also be a mistake because she’s a suboptimal candidate. While Clinton is far more union-friendly than anyone running for the Republican nomination, her labor credentials are significantly worse than her main challenger in the Democratic primary, Vermont Senator Bernie Sanders. Sanders has continued to advocate for the same causes in Congress over the past 25 years. In 1994, for example, he introduced the Workplace Democracy Act, legislation designed to strengthen collective bargaining rights. He currently supports the Employee Free Choice Act, which would make it easier for workplaces to hold union elections, and plans to introduce a new Workplace Democracy Act this fall. He has “convened annual meetings of labor activists to help them develop more successful organizing and bargaining strategies” and still walks picket lines with workers. To be fair, Clinton also supports the Employee Free Choice Act. Her campaign rhetoric is pretty pro-union, and the promises she makes in her video to NEA members don’t sound all that different than those made by Bernie (videos below). But Clinton’s record is significantly worse than Sanders’. She served on the board of directors of Walmart – which to this day remains one of the nation’s most notoriously anti-union businesses – from 1986 to 1992, for instance. According to reports that surfaced in 2008, Clinton sat through dozens of board meetings without ever speaking up on behalf of organized labor. Instead, she stated that she was “proud of Wal-Mart and what we do and the way we do it better than anybody else.” Though she has since renounced Walmart’s business practices, Clinton maintains close ties with Walmart executives and lobbyists. And during her presidential campaigns, she’s surrounded herself with staffers who have troubling anti-union connections. Clinton has worse policy positions on key union issues as well. Bernie Sanders has been a leader in the effort to oppose the Trans-Pacific Partnership, a “free trade” deal that could undermine environmental and consumer safety protections and have harmful impacts on workers both in the US and abroad; Clinton, despite recent attempts to distance herself from the TPP, was heavily involved in negotiating and promoting it. Sanders has been a vocal proponent of a $15-an-hour federal minimum wage by 2020, which workers around the country are campaigning for; Clinton long resisted taking a specific position on the issue and only recently spoke favorably about raising the federal minimum to $12-an-hour. Sanders’ positions on education issues also tend to be more power-balancing than Clinton’s. Both candidates have called for universal pre-K and increased college affordability, but while Sanders believes education is a right that should be guaranteed free of charge to all students, Clinton hypocritically opposes free college for “kids who don’t work some hours to try to put their own effort into their education.” At the K-12 level, Sanders also has a stronger vision and record. After initially supporting the House of Representatives’ version of No Child Left Behind in May of 2001, he voted against the final version of NCLB that year because he foresaw problems with “the bill’s reliance on high-stakes standardized testing to direct draconian interventions;” Clinton, on the other hand, cast her vote in favor of NCLB. Sanders believes that “the federal government has a critical role to play” in education policy, one that includes “guaranteeing resource equity,” “increased emphasis on a well-rounded curriculum,” and providing “the resources necessary to provide effective professional development;” Clinton might not necessarily disagree, but while Sanders asserts that he will “direct education funding toward the low-income students who need it most” in his response to the AFT’s candidate questionnaire, this commitment is noticeably absent from Clinton’s writeup. In fact, on practically every topic – from criminal justice issues to health care to foreign policy – Sanders has Clinton beat. His platform isn’t perfect, but it’s far and away more in line than Clinton’s with what typical Democratic voters profess to want. As far as I can tell, nobody at the AFT (or NEA) actually argues that Clinton has better policy positions than Sanders; their endorsement processes seem to be driven by the belief that Clinton is more electable. The problem with that thinking is twofold. First, Sanders is actually just as electable, if not more so, than Clinton. In national polls that pit potential Democratic nominees against potential Republican nominees, Sanders and Clinton do about as well as each other. If Sanders had anything like Clinton’s name recognition, he’d almost certainly outstrip her; among voters who know who he is, Sanders’ favorability is much higher than Clinton’s (see page 5). He’s shooting up in Democratic primary polls as more and more voters learn about him and now holds sizable leads in New Hampshire, Iowa, and Oregon. College students prefer Sanders to Clinton by more than a 3-to-1 margin, policy positions like the ones he holds are wildly popular across the board, and his campaign is showing no signs of losing momentum. Second, the biggest impediment to a Sanders victory is none other than the political calculus the unions seem to be engaged in. Politicians are electable if people are willing to support them, while concerns about electability generally undermine progressive goals and become self-fulfilling prophecies. Rather than settling for Hillary Clinton because they – erroneously – think she’s the best that people will buy, unions should rally behind the better candidate – Bernie Sanders – and start selling him to the American public. Labor for Bernie, a grassroots movement started by rank-and-file union members, could ultimately prove more important than endorsements from the major national unions. And Sanders already has the support of National Nurses United. Nonetheless, it’s incumbent upon NEA leadership, and the leaders of other major unions, to start paying attention to why so many union members feel the Bern. Sanders, much more than Clinton, deserves organized labor’s official support. Update (10/3/15): The NEA endorsed Clinton – without any explanation of why members should prefer her to Sanders. 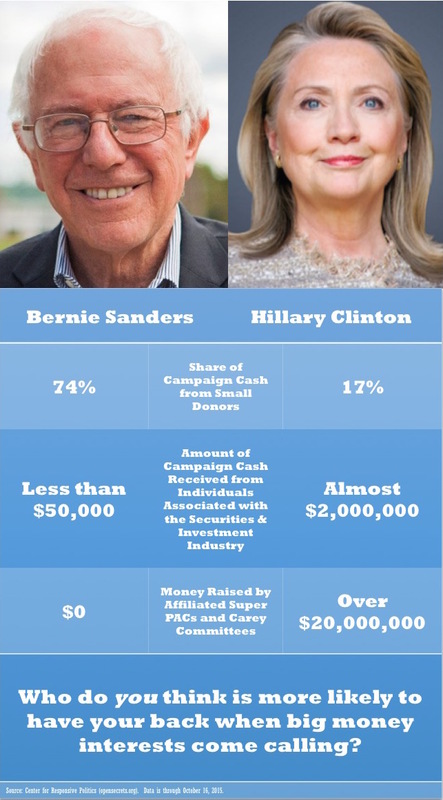 Update (10/26/15): For those interested in the analysis behind the updated meme below, which compares donations during the 2016 presidential campaigns alone, see this post. In this post, Part 2 in a series on Democratic presidential candidate Hillary Clinton, Emilio da Costa documents some of the actions that President Barack Obama has taken in the interests of the very wealthy. Emilio, who holds a master’s degree in City and Regional Planning from Berkeley and a bachelor’s degree in Urban Studies from Stanford, argues that Clinton is likely to follow suit – she has much deeper ties to Wall Street than to those whose votes she will be seeking on the campaign trail. Part 1 of the series, which focused on Obama’s political appointments, can be found here. As was required at the time, Obama made promises during his campaign to rein in Wall Street and introduce regulatory reforms to the financial industry. All of the grumbling about Obama’s tax policy being socialist makes it hard to believe the extent to which he supported legislation that so disproportionately benefited the very wealthy. Obama not only extended the Bush tax cuts that he said he would repeal, but in the case of the estate tax, supported the even more regressive policy of lowering the rate and raising the exemption limit in 2010’s $858 billion tax-cut legislation. Although Democrats claim they were forced to compromise on a 35% rate with a $5 million per-person exemption to prevent a worse outcome in the future, if no law were to have passed that year, a 55% rate with a $1 million exemption would have taken effect. When introduced, the exemption limit of $5 million meant that only 0.2 percent of all estates would be eligible to owe any tax, the smallest percentage since 1934 – except for 2010, which Bush’s 2001 tax-cut legislation mandated would be totally estate-tax-free. Days after Obama signed the 2010 legislation, while interviewing Chris Hedges for Democracy Now, Amy Goodman summarized the impacts more generally: “At least a quarter of the tax savings under the deal will go to the wealthiest one percent of the population. The only group that will see its taxes increase are the nation’s lowest-paid workers.” During this interview Hedges argues that “one of the most pernicious things that Obama did in this tax bill was reduce contributions to Social Security, because of course that’s next on the target.” With Obama’s 2013 budget plan having cut Social Security and Medicare by much more than the GOP alternative, it appears Hedges’s predictions were well-founded. Clinton’s outrage, though, did not stop her family’s foundation from raking in donations from many of the same banks that secured government fines rather than face full-scale prosecution. The Clinton Foundation has accepted $5 million worth of donations from at least nine financial institutions that avoided such prosecution — even as they admitted wrongdoing. In that same speech, Clinton said, “HSBC allowing drug cartels to launder money, five major banks pleading guilty to felony charges for conspiring to manipulate currency exchange and interest rates. There can be no justification or tolerance for this kind of criminal behavior.” If Clinton believes that there can be “no tolerance for this kind of criminal behavior,” then it is a bit strange that, “in 2014, two years after HSBC admitted to major violations of U.S. laws, the firm was the top sponsor at a Clinton Global Initiative (CGI) event, paying at least $500,000 to the Clinton Foundation.” In fact, in addition to the CGI and the Clinton Foundation both having an illustrious record for accepting sponsorships and donations from criminal banks, both Clintons have accepted outrageous speaking fees from them, too. The HSBC relationship — taking money from a bank after the firm admitted wrongdoing — was not unique. In 2009, UBS avoided prosecution by the Justice Department when it agreed to pay a $780 million fine and admitted to defrauding the United States by allowing American citizens to hide income from the IRS. The Swiss bank has since entered into two more agreements with the Justice Department — one for rigging the municipal bond market and the other for manipulating global interest rates. UBS has paid former President Bill Clinton more than $1.5 million for speeches since 2009, and the firm has given more than $550,000 to the family’s foundation. In 2010, the British banking firm Barclays entered into a settlement agreement with the Justice Department, and admitted to violating U.S. sanctions by making transactions for customers in countries such as Libya, Sudan and Myanmar. Weeks later, Barclays was sponsor at the annual CGI event. Barclays has remained a CGI sponsor in the years since, even after the bank paid more fines under a new agreement with the Justice Department for manipulating worldwide interest rates. Barclays has paid the Clinton family $650,000 for speeches since 2009. The firm has given at least $1.5 million to the Clinton Foundation. Covering a speech Clinton gave on July 13th, Ben White for Politico reported on, among other things, her continued promise to repeal the carried interest tax break. She also “pledged to both defend existing financial reform and go even further, almost hinting at a need to break up the largest banks, something sure to go down poorly with some of Clinton’s biggest supporters on Wall Street.” However, financial reformers like Dennis Kelleher of Better Markets expect more: “The American people deserve a concrete, specific, comprehensive plan that really protects them from Wall Street recklessness and that she as president can be held accountable for once in office.” Others wonder whether she will “put in place a team of advisers who have a demonstrated history of supporting meaningful reform and tough enforcement, or chooses instead to surround herself with the same crowd of revolving door insiders.” Given the actions of the Clinton Foundation and Hillary’s personal ties to Wall Street, it is no wonder that financial reformers are skeptical she will follow through with policies that are as progressive as her vague pledges. Click here to read Part 3 of the series. Teach For America (TFA) recently released a report describing some of the results from its alumni survey. The report provides interesting information about many alums’ careers. At the same time, however, TFA’s misleading presentation of the results and the organization’s unwillingness to share the underlying data are troubling. 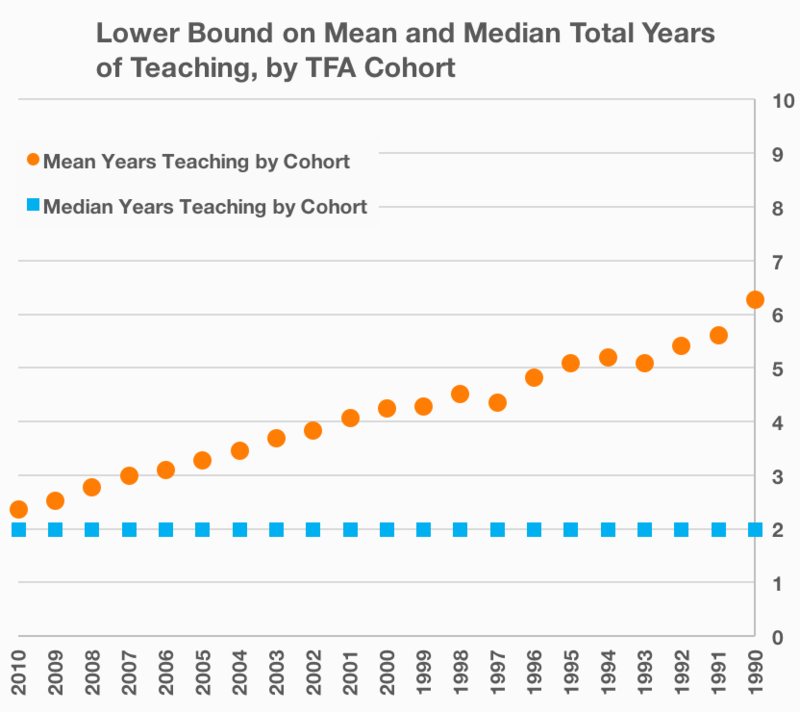 The first of these charts claims to show “the mean value on the measure of total years teaching for each cohort,” the second ostensibly shows both the “mean and median total years teaching, by cohort,” and the third purports to show “the percentages of alumni in each Teach For America cohort that reported teaching 3 or 4, 5 or 6, or more than 7 years.” A reader could easily think these statistics apply to everyone who joined Teach For America between 1990 and 2010. But the charts depict statistics only for most TFA alumni who responded at some point to a TFA alumni survey; the two biggest categories of people they ignore are alumni who never responded to a survey and former corps members who did not complete their original two-year teaching commitments (while Raegen Miller and Rachel Perera, the authors of the brief, are clear that only alumni are their focus, the word “cohort” invokes images of all corps members that began teaching during a given year). In other words, the charts depict results for an unrepresentative subset of the teachers who join Teach For America. The 23,653 alumni represented here represent about 85 percent of the alumni from the 1990 to 2010 cohorts. While alumni who don’t respond to the survey may be systematically different than those who do respond, the response rate is high enough to bolster the case that our statistics speak pretty well to the population of alumni. The alumni survey is administered only to those who complete their initial commitment to teach for two years. 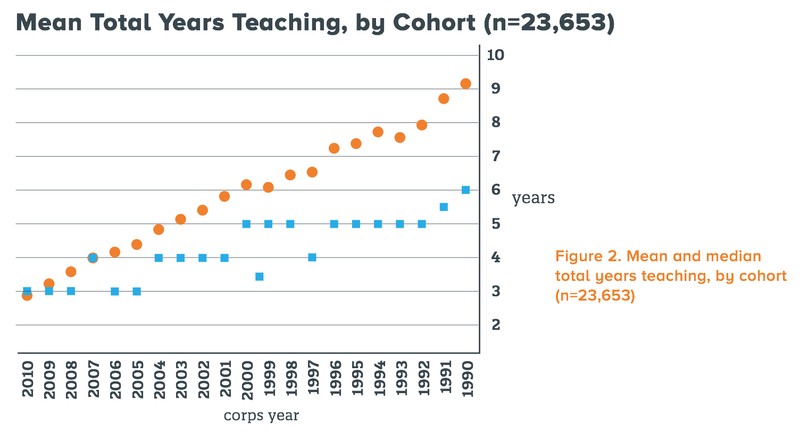 Alumni reporting fewer than two years of teaching on the survey, or more than the number of years possible since their corps year, were excluded from these analyses. This statement is false because, as noted above, TFA does not have reports from the full population of “more than 42,000 Teach For America alumni” (TFA alumni may also incorrectly report that they work in “other capacities serving low-income communities” when they don’t in fact do so, but that’s a different conversation). The charts below thus attempt to describe what the survey results actually tell us. Because TFA won’t share their underlying data and declined to comment on this section of my post, the charts present a likely lower bound based on some simplifying assumptions I made: namely, that TFA has usable responses for at least 70 percent of alumni in each cohort (I’m told that response rates are typically lower in earlier cohorts), that fewer than 15 percent of corps members quit TFA before completing their second year of teaching, and that these corps members who quit average 0.75 years of teaching. We cannot assert with confidence, as the report does, that “of those alumni from cohorts having had abundant opportunity to teach at least 5 years—say, those before 2001— approximately half have done so.” Instead, with worst-case assumptions about alumni who didn’t take the survey, we know that at least between 34 and 39 percent of alumni from these cohorts taught for that amount of time. If we include non-alumni in our calculations, as my revised charts show and seems appropriate, the lower bound drops even further (to a little less than one third of the teachers in each corps year). 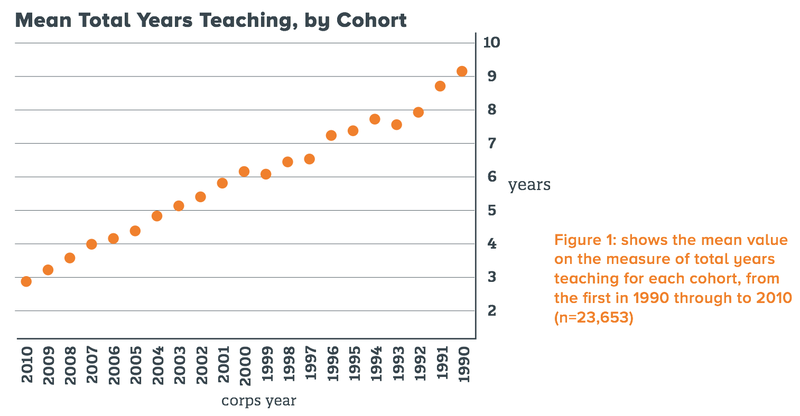 It also appears to be possible that the majority of TFA corps members teach for two years or fewer. That doesn’t mean these lower bounds are the actual percentages – in fact, I suspect that the true percentages, while likely lower than the report’s estimates, are closer to what Miller and Perera report than to the lower bounds. Unresponsive alumni aren’t necessarily less inclined to continue or return to teaching than those who respond to surveys. I also imagine that some corps members who leave before becoming alumni eventually return to the classroom through other channels. 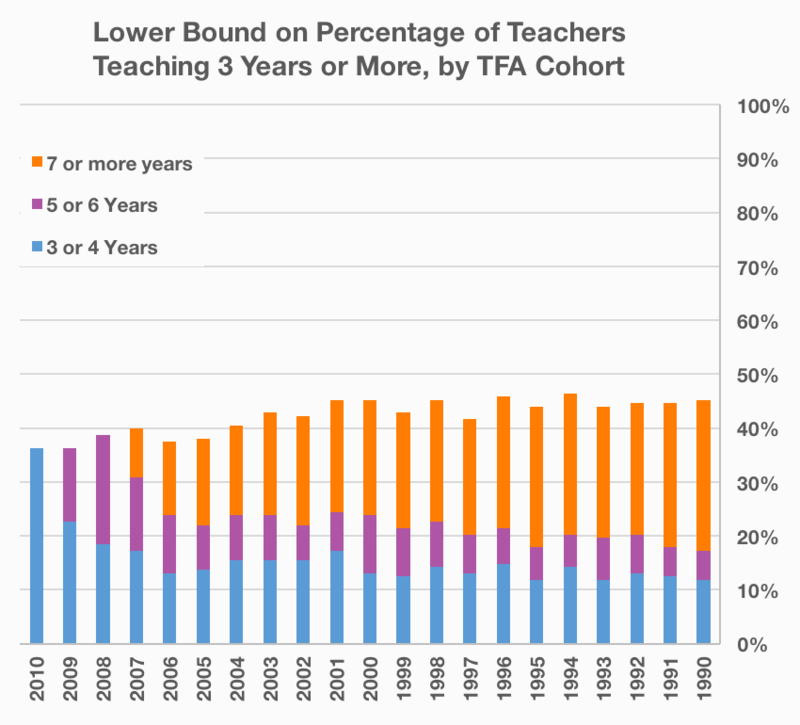 Furthermore, even if the lower bound is closer to the truth, it’s clear that a good chunk of TFA alumni have extended teaching careers. And while TFA’s attrition is greater than teacher attrition in general (which is still pretty high), critics sometimes forget that creating lifelong teachers is not TFA’s purpose. A key part of TFA’s mission is to expose people interested in other careers to the obstacles facing low-income kids – to turn alumni who will go on to work in other fields into lifelong advocates for disadvantaged populations (this goal can backfire – prominent alumni too often undermine social justice efforts – but I believe it is an admirable goal). The thing is, a thorough and honest look at TFA’s statistics isn’t damning. The organization has many problems and needs to improve, but its teachers certainly aren’t harming students. What is damning, however, is TFA’s lack of transparency. I’m afraid we won’t be posting the cohort-level n’s for the main analytic sample featured in Unsung Teaching. The brief does enough to defend the findings as is. In particular, the take-away points are broad ones, spanning many cohorts. And the footnotes document the rather conservative approach. Over 85 percent of alumni from the cohorts portrayed are represented in the analytic sample. At the cohort level, the percentages vary in a pretty predictable way, but none of them is small. Hard generalizations at the cohort level would be defensible, for the most part, but we didn’t go there. The little social media exchange has totally confounded the issue of response rate on the annual survey and the n’s you seek. 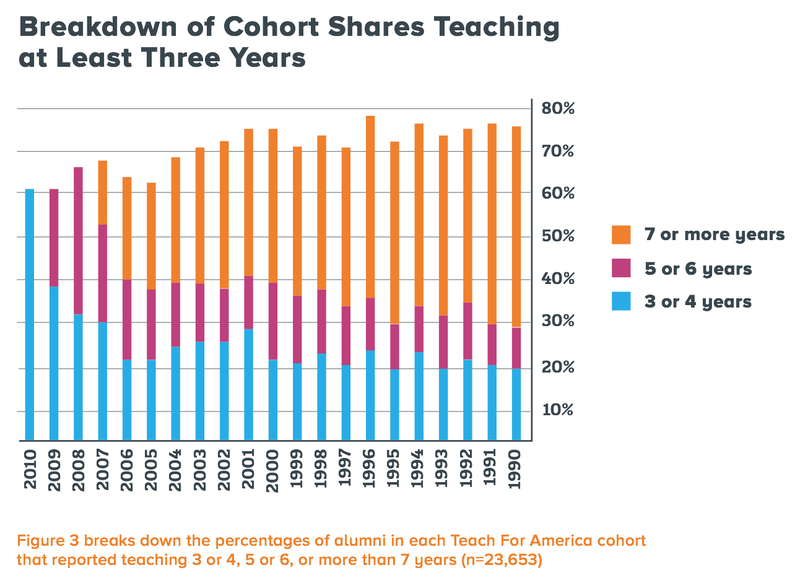 The reason 85 percent of alumni (from cohorts 1990 to 2010) are involved is that some of the responses come from older surveys than the 2014 one. Using some dated responses improves the generalizability, but it does bias the statistics—downward. People can dispute the value of the work, but there’s not much of an argument to make with the n’s, at least about the brief. Thus, the decision not to share. Miller makes some good points about the interpretation of the results. The size of the sample – over 85 percent of total alumni from the studied cohorts – is impressively large. Additionally, Miller is right to point out that the inclusion of older survey data could bias the results downwards (an alum who had taught for only two years when she filled out the 2010 survey, for example, might have taught more in the time since despite failing to fill out another survey). But neither of these points provides a justification for declining my request. The data I (and others, in the social media exchange I believe Miller was referencing) asked for should not be particularly difficult to provide. Refusing to share it just doesn’t make sense if the data is legitimate – it serves only to make people wonder if TFA has something to hide. On some level, TFA’s decision here is part of a broader pattern of data misrepresentation. Many of my colleagues and I observed it on a small scale at TFA’s Institute in 2010 and it’s apparent on a larger scale when TFA propagates bogus statistics about corps members’ impact. Key TFA decision-makers still seem in too many cases to care more about promoting TFA as something that “works” than about honest and accurate assessment of evidence. Since TFA proclaims that they “welcome independent research efforts to assess [their] impact and inform the continuous improvement of [their] program,” I find these actions to be pretty hypocritical. Because the vast majority of the TFA staff I know (including Miller) care deeply about educational equity, I also find TFA’s organizational mindset baffling. As I’ve written before, our students “depend on us to combat misleading claims by doing our due diligence, unveiling erroneous interpretations, and ensuring that sound data and accurate statistical analyses drive decision-making.” TFA’s disinterest in data sharing does such analyses – and thus low-income students – a disservice. The simplest fix to these problems is for TFA to appropriately caveat alumni survey results and, more generally, to improve the way they report statistics. TFA could also use random sampling to obtain more representative data. We used stratified random sampling for one of our member surveys when I was on the Executive Board of the San Jose Teachers Association (SJTA) and it paid major dividends; we could for the first time speak confidently about the generalizability of our results. Interestingly, the results from SJTA’s random sample closely resembled the results from our pure volunteer survey. The same could conceivably be true for the findings from Miller and Perera. It’s just impossible to know without more research. More importantly, TFA’s misleading data presentation and lack of transparency, combined with TFA’s silence in response to thoughtful critiques in other domains, make it difficult to trust the organization. For an alum like me who deeply respects almost everyone on TFA staff I know and who thinks TFA could potentially be a strong ally in the fight for social justice, that’s a real shame. The discrepancy between Barack Obama’s campaign rhetoric and actions as President have disappointed many of his former supporters. In this post, the first in a series focused primarily on Democratic presidential candidate Hillary Clinton, Emilio da Costa explains why Obama’s political appointments bode poorly for what a Clinton presidency might bring. Emilio, who holds a master’s degree in City and Regional Planning from Berkeley and a bachelor’s degree in Urban Studies from Stanford, will in future posts explore specific policy areas in which Clinton’s record raises questions about the sincerity of her stated intentions. On April 12th, Hillary Rodham Clinton officially announced that she will be running for the presidency in the 2016 election. If victorious, she will be the first female president in American history, and so, understandably, there has been considerable attention given to what that achievement would mean for gender equality. That having a woman become president would ‘shatter the glass ceiling’ is a widespread sentiment among her supporters and the hope attached to this sentiment gives her a tremendous amount of populist appeal. Unfortunately, while hope is a strong currency in the market for votes, it doesn’t always exchange so well in the realm of actual policy decisions. We saw this same situation with Obama. Who better than a black man who eloquently spoke of hope, change, and progress to embody the ideals of civil rights, accountability, and equality that so many Americans were yearning for? And yet, even though the rhetoric was always there, the reality was a stark contrast. The Obama Administration deported more immigrants than any other in American history. While arming and funding the ‘moderate’ rebels in Syria and, at one point, drone-bombing Yemen, Somalia, Libya, Afghanistan, and Pakistan simultaneously, Obama contradicted his supposed dedication to cooperative multilateral decision-making by unilaterally expanding war powers well beyond George W. Bush. Even the “landmark reform” in health care that the Obama Administration managed to pass, the Affordable Care Act, is a lot less impressive when you compare it to a strikingly similar GOP-sponsored health care reform plan from 1993. By making Tim Geithner his first Cabinet appointment and maintaining “Goldman Sachs’s seeming lock on high-level U.S. Treasury jobs,” Obama made it quite clear early in his presidency that he was not the progressive he purported to be. Another appointment with a glaring conflict of interest was Monsanto’s former Vice President for Public Policy, Michael Taylor, selected to be deputy commissioner at the FDA. Even Obama’s appointments most widely praised by the mainstream liberal media have seriously tainted records. A key example of this was his appointment of Eric Holder as attorney general. In 2003, an Organization of American States report showed that Chiquita’s subsidiary in Colombia, Banadex, had helped divert weapons and ammunition, including thousands of AK-47s, from Nicaraguan government stocks to the AUC. The AUC – very often in collaboration with units of the U.S.-trained Armed Forces – is responsible for hundreds of massacres of primarily peasants throughout the Colombian countryside, including in the banana-growing region of Urabá, where it is believed that at least 4,000 people were killed. Their systematic use of violence resulted in the forced displacement of hundreds of thousands of poor Colombians, a disproportionate amount of those people being black or indigenous. In 2004, Holder helped negotiate an agreement with the Justice Department for Chiquita that involved the fruit company’s payment of “protection money” to the AUC, in direct violation of U.S. laws prohibiting this kind of transaction. Another appointment that hinted toward Obama’s true colors occurred before he was elected. Like Holder, mainstream media outlets have reported very little on the unsavory aspects of Vice President Joe Biden’s history, which include having been responsible for drafting and introducing the Omnibus Counterterrorism Act of 1995, the precursor to the PATRIOT Act so infamous for its nullification of constitutional civil liberties. More recently, the appointment of Loretta Lynch as the new attorney general has been lauded because of the opportunity it presents for the first black woman to hold the position. …HSBC was caught laundering $800 million for the notoriously violent and wealthy Sinaloa drug cartel in 2012 yet skated with a $1.9 billion fine — less than 2.8 percent of HSBC’s $68.3 billion in revenue for that year. To put that in perspective, if a person making $40,000 a year was fined the same percentage of income, it would only be $1,113, or about a month’s rent. And after Citibank was caught purposefully misleading investors to buy mortgage-backed securities that the bank knew were junk, Lynch’s office fined the bank $7 billion ($3.8 billion of which was billed to U.S. Taxpayers). In 2005 Lynch was recruited by US Ambassador-at-Large for War Crimes Stephen Rapp to administer “victor’s justice” upon the losers in Rwanda’s civil war. The US had backed Paul Kagame, trained at Ft. Leavenworth Kansas, who shot his way to power with an army that included child soldiers. In the process Kagame’s forces committed a sizeable share of the 800,000 murders in what the world knows as the Rwandan genocide. So in Rwanda Loretta Lynch interviewed only persons brought to her by Kagame’s cronies. Like the rest of the International Tribunal, she never questioned Kagame’s role [in] assassinations of the Rwandan and Burundian presidents, the tens of thousands of murders that occurred in areas controlled by Kagame’s forces, or the role of Kagame and his partners in the ongoing pillage of neighboring Congo which had taken some 5 million lives and counting by 2008. We shouldn’t expect anything better in the way of appointments if Hillary is to become president. 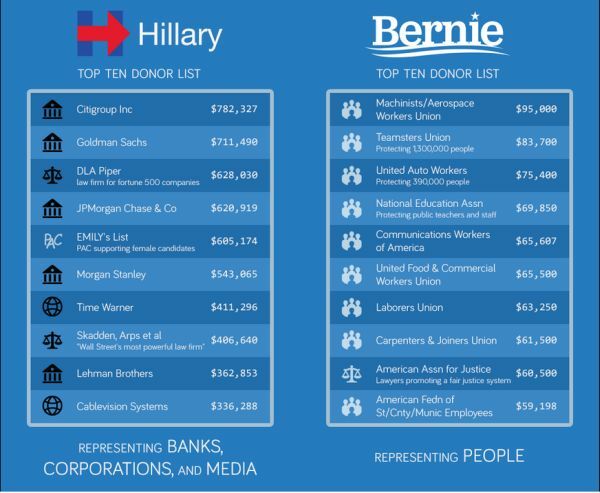 From donations to the Clinton Foundation to generous speaking fees and campaign contributions, there is substantial reason to believe that the relationship between Washington and Wall Street would only grow stronger with her at the helm. Despite Clinton’s effort to appeal to economic populism and appear tough on the financial industry, the next part of this series, with much credit to Matt Taibbi, will show that Clinton’s ties to the banksters run much, much deeper than do her ties to those she will be pandering to on the campaign trail.